Dead Robin Sketch – Let's Paint Nature! This morning when I arrived at work I saw a large lump laying in the parking lot. What’s that??? As I got closer I realized it was a poor robin that lost his race with a car. I’m guessing this poor robin was not hit at a high speed because there was no blood, just a crushed-in skull on one side. This little sketch was done with Graphitint water soluble pencils by Derwent. I was not interested in completing the whole bird, but just some interesting features on the head. I noticed several white spots around his eye, and on his throat. He had lovely little bristle like hairs around the base of his beak and even though dead, light still reflected off his eye giving it a certain sparkle. 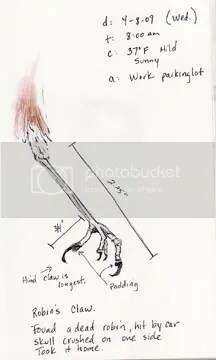 In this sketch I took interest in his claw. Even after several hours of death I was still able to move his joints and study their segmented connections (with gloves on, of course). Nature isn’t pretty sometimes. It’s not even merciful when you think about it. But everything has a purpose and a time. ← Let’s Paint the Crocus! That’s a good idea to use an unfortunate accident like finding this poor dead bird to study him up close. I noticed that you mention hiking in your heading…do you do geocaching? I don’t yet but my niece got me interested when she was visiting us a few weeks ago. Thanks for visiting my site. I like your nature paintings…there’s no better subject. 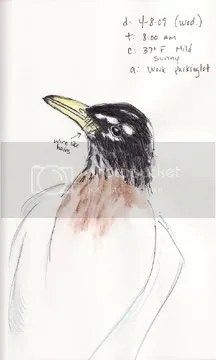 Dead birds are very sad but I love that you took the opportunity to sketch it in your journal after closer observation. Also, I love your new painting in the header on your blog…so pretty. Oooh, poor robin, but a great opportunity for some research & practice. Lana: I agree! I need the practice and it’s a nice way to honor the robin’s life! Great article, thank you for writing about this. You have a lot of informative articles here, thanks again! I really enjoy this hobby, my son and I have been participating in it for awhile now. We are contemplating purchasing a Magellan RoadMate for our vehicle. Do you have any experience with this unit? Click here if you’d like to check out my site. Thanks again for a very educational site!